(Sam) About 12:30am, the ticket dood got in his little booth. Note: remember we had bought the tickets in Samos and confirmed them three times on Patmos. In case you are booking a ferry this was Dane Sea Line Travel Agency. So we went over to the ticket dude to confirm a fourth time and he told us that there was no ferry to Rhodos that night. You can imagine our astonishment. We all started to curse at him in strange and indistinguishable tongues. At the same time another man who Chris had already confirmed our ferry with came and also told us that the ferry did not exist that he had previously told Chris would come about 12:30. I had to constrain the normally docile Joe who almost riped both men's hearts out and ate them. During the course of this conversation, the ferry docked. Fearing for his life, the ticket dude, while flipping through papers, told us that this ferry went to KOS, but there was another ferry from KOS to Rhodos that morning. We jumped on the ferry which was very large (the biggest ship I have ever been on) and headed to KOS. KOS was an island we had never herd of, but we expected only to use it as a transition port on our way to Rhodos. I found a chair that was broken so it reclined all the way down flat. I promptly fell asleep for hour tour to KOS. KOS The Island We Didn't Want To Know. We arrived in KOS to discover the ferry to Rhodos had already departed. It was about 5 in the morning so we walked through some Crusader walls and found a nice little park area with some grass to catch some shut eye. Just after sunrise, I awoke to the sound of a gardiner who was smiling and asking Dave if he was napping. the answer seemed obvious and Dave and myself pretended not to hear him. About an hour later, we awoke again to the sound of birds. Greg and Chris bought breakfast and we ate it in the park. We also discovered from Let's Go that it was illegal to sleep in this park which was the main park of KOS. After this discovery, we packed up camp to go climb the Crusader Walls. The said walls were cool but short, very, very short. the bathrooms were refreshing also. It was on these very walls that Greg Bodoh snaped one of his famous contrast photos. 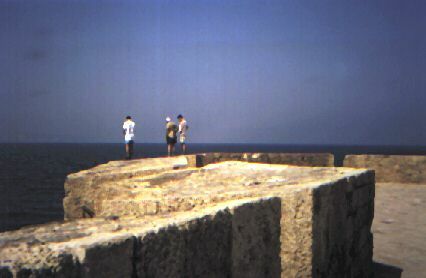 From the old Crusader walls, you could see a modern battleship. If you want to see the actual photo, you will have to wait. Just imagine. We then scattered to preform various meneal tasks of which the only one I remember is that Chris and I bought food. 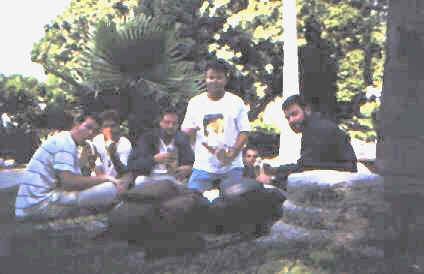 We ate in our former camp site which we were surprised to discover was the most popular place in KOS. It actually housed a tree planted by Hipocrates just 500 years ago. Really, it's true. Next stop: two-wheeled motion machiens. Dave? (DAVE) Hang on to your hats, KOS, 'cause we got wheels. 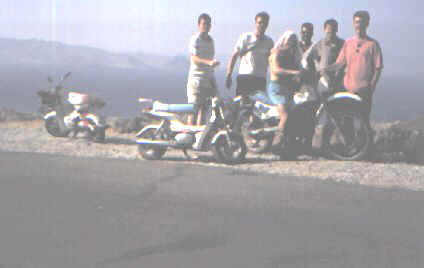 Joe and I, Chris and Sam, and Greg and Matt (in those respective pairs) hopped onto some mopeds (Matt actually had a dirt bike) and went off to see the LAND of KOS. We drove along the coast for awhile before stopping at one of the local beaches. To rent the jet skis was about $40 for a half minute (or thereabout) and the windsurfers were quite expensive as well, so we settled for some volleyball. The games were pretty lame since we only had a 10 lb. plastic children's size-type volleyball. Although it was somewhat pleasurable for Sam and me to defeat Joe and Chris in a two-on-two game. After volleyball, the guys (minus myself) went for a swim. And then back on the bikes... Some of us switched drivers and headed up into the hills. It was quite exhilarating for the wind to be blowing through your hair, while dodging cars, buses, mopeds, cats, dogs, pot holes, bumps and other misc. 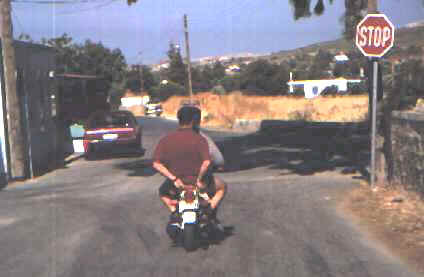 obstacles of the road, all the while having a guy on your back seat with his life in your hands. Pretty exciting... But back to our story... We ended up heading up some mountainous road with enough twists and turns to make anyone's head spin. We then reached a point at which we realized we had better head back. And then something very strange happened. Somehow I got on the backseat of the moped Sam was driving (or should I say, attempting to drive.) It was an exciting drive - to say the least. At times, it seemed as though we might be heading for some pretipice before Sam barely makes a turn going downhill. At one point, I practically HAD to lunge forward (to save us both) to motion to Sam to hit the brake. Our waiter (who was the owner of the restaurant) was very friendly and entertaining. he liked gambling and he entertained us with a card trick of his. The food was good and we had our fill. Our ferry (and boy - what a ferry - largest ship I think any of us had ever been on) was due to leave at 8:30pm, Thursday, June 26th. Our ride to Piraeus (Athen's port) was about 10 hours. Our ride was pretty much uneventful other that aweing over the awesome size of our ship and going to the top deck to feel the 60 mph winds. It was a funny situation as well - to be there - in one of the ship's lounge areas - trying to sleep (mind you) while people were drinking and talking and laughing and (in some cases) kissing all around us. The TV's were all on and right beside our sleeping area (there on the carpeted floor) was this crazy disco dance floor with music and lights and bells gong off till the wee hours of the morning. And the funny thing was - NO ONE was even using the damn dance floor - except two little girls (who apparently knew all the Greek songs they were playing.) Chris and Sam were smart enough to move out of the lounge area and under some stairs for the night. Between the four of us that were left, we probably got a total of six hours of sleep (that's 1 1/2 hours of sleep per person.) No - it wasn't quite that bad, but it wasn't (let us say) one of our best sleep nights.